The improved R1+ includes all new linear motion and lead screws for better quality, performance, and consistency. This includes a better filament feeding system for ease of use and a "quick release" for fast change out of the extruder. Additional components for leveling, guidance, and performance of the R1+ make it the best option for desktop 3D Printing today. 24/7 Robo Support - ROBO 3D is now offering 24/7 phone support to make sure our customers are taken care of at all times, including the ability to schedule a 1-on-1 repair session with a technician via Skype video. Big Build Volume - Fabricates parts up to 10 x 9 x 8 inches (D x W x H) in size or 720 cubic inches in volume. Print bigger and better with one of the biggest build volumes for the price. 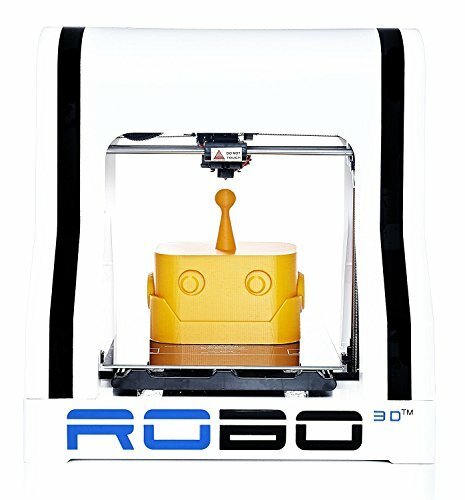 Plug & Print - The R1+ ships fully assembled and calibrated so you can start printing right away. It also comes fully equipped with an SD card to allow you to print directly from an SD card so you no longer need to always be plugged into your printer via USB.